Pet training can have its ups and downs. I tried to train my dog to be calm when friends came over, but inadvertently trained him to bark ferociously whenever I said the word, “friends.” When he’s on a leash and I say, “Let’s go,” he starts by giving a little preliminary jump. I don’t know what I did to train these behaviors, but he obviously picked up on some unintended signals. Pet parents find training tips in a variety of places, including online. Thinking that training a pet would be a good New Year’s resolution, we asked our December newsletter readers what resources help them understand their pets’ behaviors. Watching full-length television programs about training pets was the top answer at 55%. One respondent mentioned that you should keep in mind that TV shows often emphasize only one method of training- – and there are many to choose from. Reading books about pet behavior and training was your second favorite choice (51%). Some of you mentioned that you favored books because you could easily refer back to them, a good point. Another 40% of you liked using the Web for training tips. That could include articles and overlap with our next category, training videos, which ranked at 33%, with the advantage cited that they are often short and to the point and focus on one training goal. By now, if you have a mathematical bent, you can see that these percentages don’t add up to 100%. That’s because many of you use several or all of the resources available. Good for you! By trying different media, you glean much more information and can find your own favorite. We were gratified to see that 40% of you have looked at Petfinder training videos. For those of you who don’t know there are training videos on Petfinder, we invite you to click on the videos tab on Petfinder, then search on “training” or on specific topics, like “barking,” “jumping” or “counter surfing.” We love our videos. 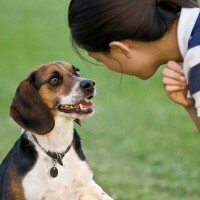 Petfinder also has many articles on training your dog or cat. From time to time, Petfinder has online question-and-answer sessions. Only 11% of you mentioned using this resource. The good news about these is that they are live and you can get your specific questions answered by an expert. Keep an eye on our blog, Facebook page and newsletter for when the next of these is scheduled. An in-person trainer was a favorite of 40% of you. For teaching the basics, a puppy class is an effective way to start your life with a new pooch. These are offered through shelters, pet supply stores and some other pet-related businesses or organizations. Once through the basics, you can move to more advanced classes. Kitty “kindergarten” classes are being offered at some shelters, and privately as well. Check with your local shelter to find out if any are available in your area. Thanks for sharing your responses and check our January newsletter for our next survey.